I love fresh flowers and used to buy a bunch every week at a little stand at the Metro to decorate my apartment when I lived in Downtown Bethesda. I have been told that the longer you live in the DC area, the worse your allergies will become. Whether this is a documented fact or not, it seems to be the case with me. Now if I put fresh flowers in my house, I soon will get a sinus headache and the vase ends up in the garage. 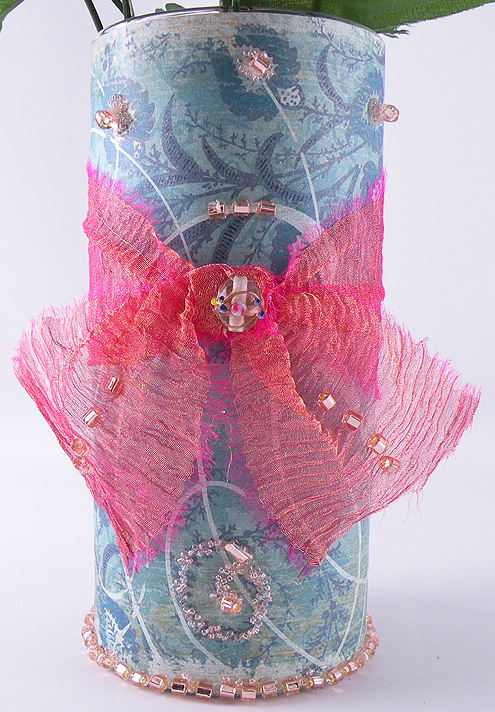 My alternative is displaying fabric flowers and I also incorporated them into many of my designs. 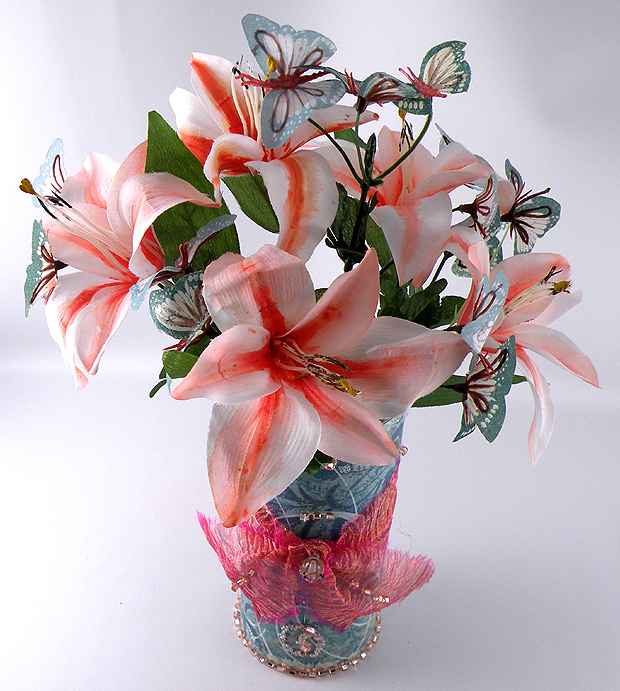 Fabric flowers can get expensive and do not always come in the colors I would like. I really wanted to display some coral colored blooms for Easter so I thought I would try painting them myself. I bought some white lilies from the dollar store, mixed some colors together and just began to paint. They came out exactly how I wanted them to look. I am so pleased my new technique that I will be buying inexpensive flowers and painting them more often. The butterflies are also from the dollar store and I painted the brown plastic bodies the same coral color. 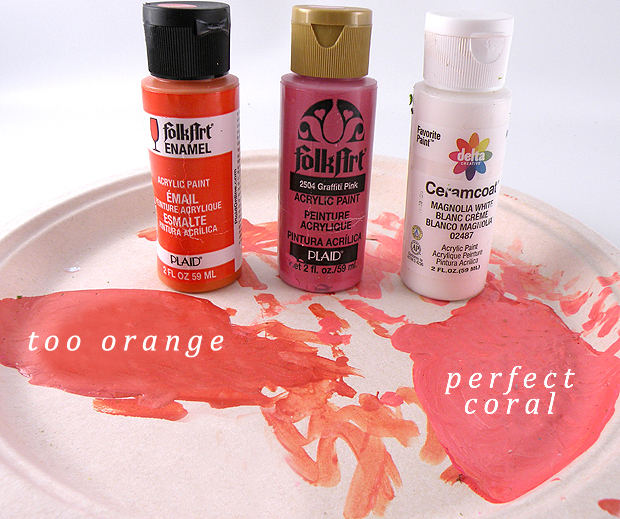 I didn’t have coral colored paint so I mixed some pink, orange and a drop of white paint on a paper plate to get my desired color. I had to keep playing with the amount of pink and white I needed to get the hue that I wanted. My first batch was way too orange. Step 1: Pull the fabric flowers off of the stem so they are easier to paint. 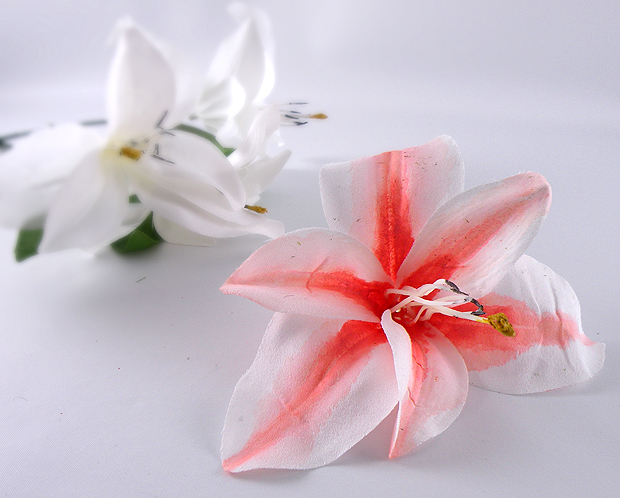 Fabric flowers usually are easy to remove and reattach. Don’t remove them if they have to be cut off of the stem. Step 2: Lightly dip the paint brush in the paint so you don’t have much on the brush. It is better to build the color gradually. Step 3: Begin painting the center of the flower. The inside of the flower should be the darkest and fade out towards the ends. Step 4: Fill a plastic cup with about 1/4 inch of water. 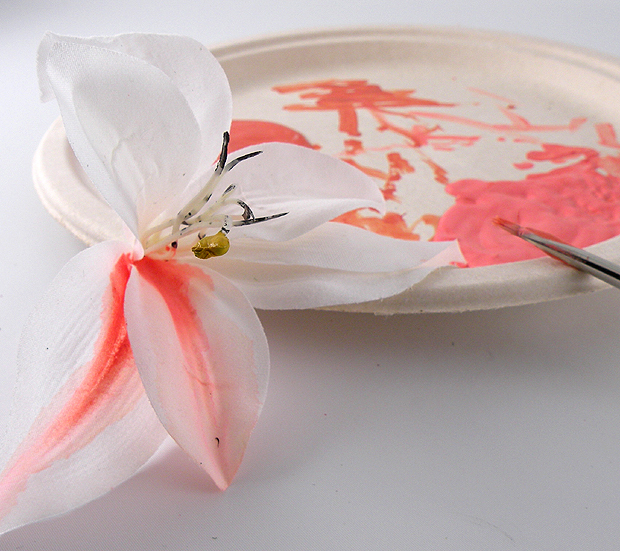 Wet your paint brush and soften the color of the paint, blending it towards the end of each petal as shown above. Step 5: Continue painting all of the flowers until you have finished your bouquet. Put the flowers back on the stem once they dry. 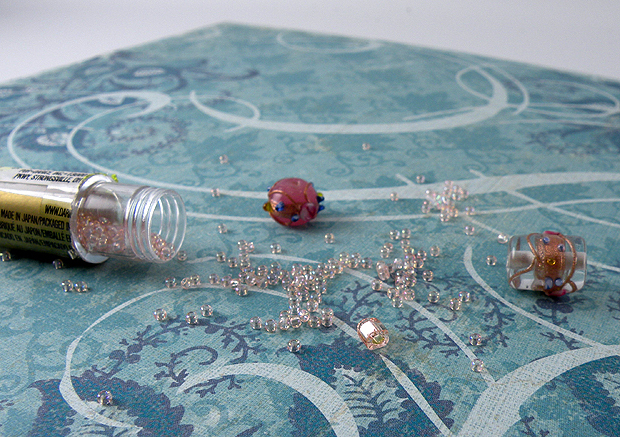 Step 6: Using craft glue, cover the glass vase with scrapbooking paper, use a piece of fabric or ribbon for a bow and add beads to different parts of the scrapbooking paper and bow to give the vase more texture and dimension. This entry was posted in Crafts, Easter, Holidays and tagged beaded vase, coral flowers, dollar store, dollar store flowers, Easter centerpiece, Easter flowers, fabric bow, fabric flowers, floral centerpiece, flower vase, Gina Tepper, inexpensive centerpiece, painting fabric, Painting flowers, scrapbooking paper, white flowers. Bookmark the permalink.